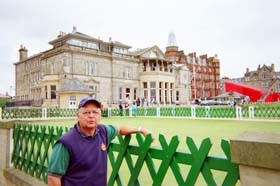 Golf Vacations UK has arranged for 4 of my trips to England, Scotland, and Ireland over the last 6 years. During these trips I have been able to play all the courses in the British Open rotation as well as numerous other great courses in these three countries. I have found Eddie and Graeme to be very competent in preparing all the details necessary for clients to enjoy a great trip. For anyone interested in a great golf experience I highly recommend Golf Vacations, UK.